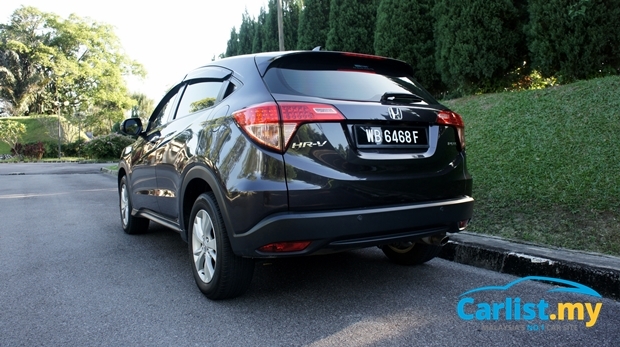 Review: 2015 Honda HR-V – How Is It Like Living With One Everyday? About nine months ago, our review of the Honda HR-V concluded that it was indeed an overachieving product. It’s not perfect, but punches well above its category. But we made that conclusion while driving it on scenic roads of Langkawi, where there is little use for Automatic Brake Hold feature (more on that later), and twisty stretches meant that you don’t go past 100 km/h for extended periods of time, and road surfaces are a lot smoother than our moon crater-like roads in Klang Valley. So how is it like to drive a HR-V as a daily car, in an urban setting, and how does it handle long distance drives? This second appointment with the Honda HR-V will attempt to answer these questions. Alternatives to the HR-V include the 1.5-litre Ford EcoSport (RM92,988 excluding insurance), 1.6-litre Peugeot 2008 (from RM119,888), 2.0-litre Mitsubishi ASX (from RM108,980), 2.0-litre Subaru XV (from RM132,724), and 2.0-litre Mazda CX-3 (from RM135,082 without insurance). “Eh, I didn’t know the HR-V had only two doors,” said a family member upon seeing the HR-V. I guess the hidden door handles are not as gimmicky as I first thought. It’s effective in disguising the 4-door HR-V as a 2-door car, with some compromise in ergonomics – it’s not as easy to open as traditional grip-type door handles. Apart from that, there is little to dislike about the HR-V’s exterior. There is something about the rice wine served in Tochigi. Somehow the engineers at Honda R&D can squeeze a lot more usable space out of the same footprint than anyone else. Don’t be fooled by the HR-V’s relatively compact dimensions. The amount of cargo it swallows and the amount of legroom it has is better than many SUVs one-class above it. 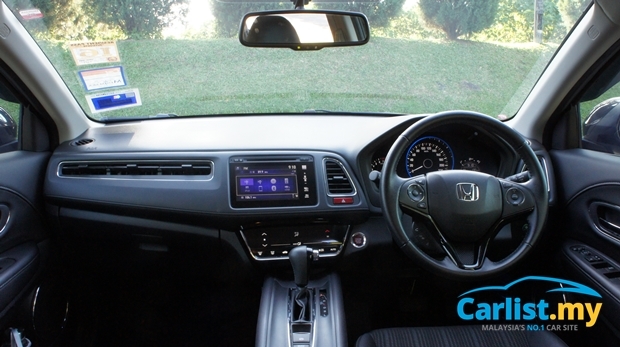 Step inside, the choice of material selection lends the HR-V’s cabin a rather premium appeal. It’s not quite as impressive as a CX-3 (keeping in mind that the fully-imported CX-3 is a lot more expensive) but it’s certainly a strong No.2. The dashboard and door panels are lined with soft-touch materials while the centre stack is finished in piano-black plastics. The two-tier transmission tunnel is a novel solution to the cabin’s limited space. 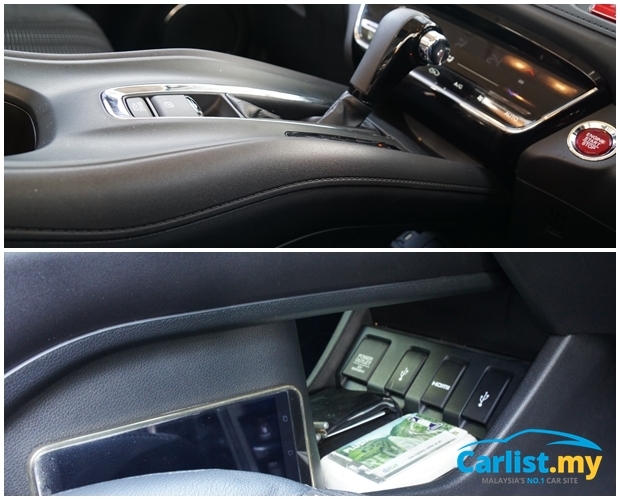 Adopting the CR-V’s dashboard-mounted shifter was clearly out of the question so in the HR-V, the floor mounted gear shifter is raised to a more user friendly position, matching the HR-V’s raised seating position. Along the way it also created a new storage space below it. 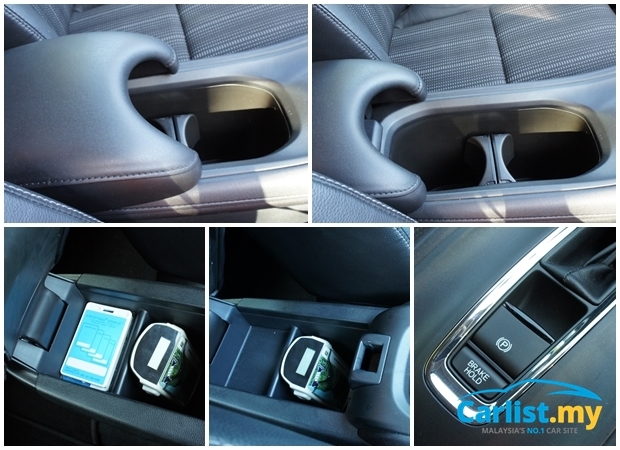 The depth of the two cup holders in the centre console is adjustable, snugly accommodating either a can of soda, or a taller 500 ml mineral water bottle. 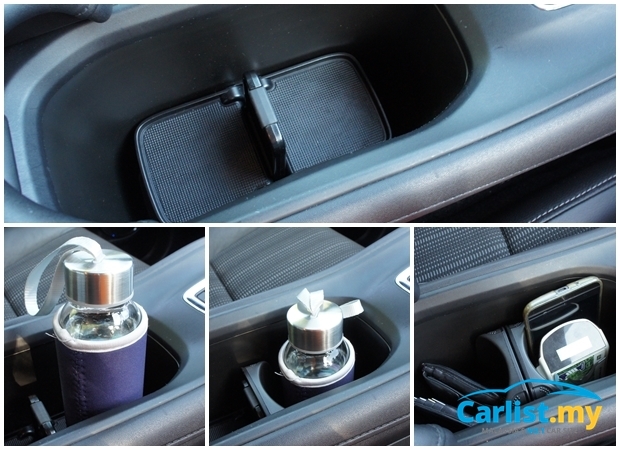 Flip the adjustable armrest upwards and it reveals storage box that allows you to organise smaller, loose items on one side, and larger objects on another – no more rummaging in the dark to reach for that key, access card, or even USB drive. 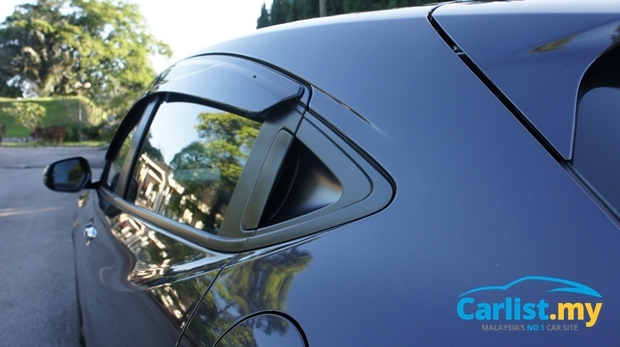 Illuminated vanity mirrors – a crucial feature for short of time career ladies to do their make-up in the car, unavailable even on the highest specifications Civic 2.0S Navi (albeit an outgoing model), is thankfully available on both sides of the V-grade HR-V. 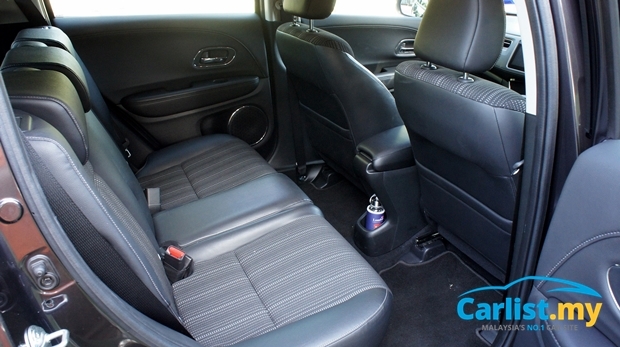 Behind, there is a plenty of legroom, and with comfortable shoulder room for three adults seating abreast. Despite the coupe-like styling, headroom is not compromised at all. Access remains just as easy, thanks to the high hip point. 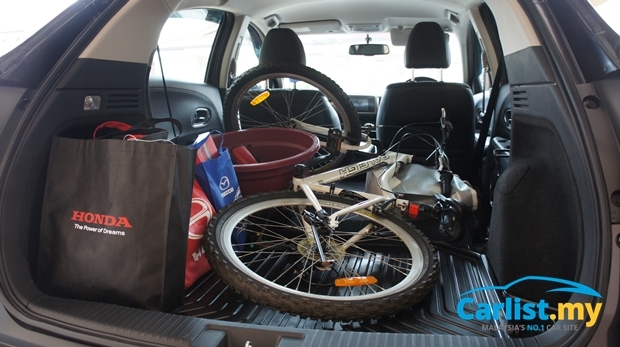 Cargo volume is rated at 437-litres with the rear seats up, and as you can see from the images below, its practicality is comparable to larger SUV models from one segment above it, including the Kia Sportage and Mazda CX-5. It’s definitely larger than its direct competitor the Mitsubishi ASX, never mind about the tiny Mazda CX-3. The seats not only fold flat, but also can be tilted upwards to accommodate tall objects. There’s enough space to keep shoeboxes underneath it – perfect for ladies who prefer to have their shoes within easy reach rather than in the boot. The foldable tonneau cover also does away with a traditional bulky tonneau cover bar. The reverse camera has a neat multi-angle feature but the infotainment’s software could be improved to fix some minor user interface issues. Scrolling through the radio channel using the buttons on the steering wheel for example, doesn’t scroll the page on the screen. Pressing the Mode button on the steering wheel doesn’t turn on the radio. Instead, you have to complete a three-step process every time you start the car. There’s the usual legal reminder that you have to hit OK on the screen or it won’t go away, select Audio on the screen, and select FM.  The system doesn’t automatically go to your last viewed screen. It’s the same after using the Bluetooth call function. This was a bit disappointing. Weaknesses which weren’t so obvious in our test drive in Langkawi began to manifest itself more strongly now on the highway. Driving performance is not the HR-V’s forte – it’s noisy at highway speeds, even when judged against other Honda models, and the 1.8-litre i-VTEC engine runs out of breath quite soon, and it doesn’t pull as strong as the Mitsubishi ASX. At 120 km/h, the noise from the CVT less than the ASX, but the HR-V’s poorer insulation against wind and road noise were quite evident. It might be more practical than the Civic, but the Civic is certainly a much better highway companion. The 142 PS is enough to push the 1,249 kg HR-V along to overtake slower vehicles, but on mountainous stretches, the lack of power is apparent. The steering is less sharp than the (improved) Civic, probably intentional considering the different dynamic attributes due to its taller ride height. It starts off feeling light enough for city driving, but as you increase your speed and steering angle, there isn’t enough feedback coming through. Body control however is very good. The rigid chassis holds up well against fast switchback corners so long as you don’t hit a rough patch. The suspension is soft but the damping action is not very refined. A rough patch of tarmac mid-corner also easily throws the car off your intended line. On smooth surfaces however, dive in to a corner at speed and the car pitches and rolls at just the right amount, in a very controlled fashion. The impressive cabin layout and high quality materials gave it a promising start but the poorly sorted suspension can make for an uncomfortable ride on certain stretches. The soft suspension lacks sufficient travel and it hits the bump stops very easily, even when coasting over speed bumps at just 20 km/h. At the same time, the damping is not refined enough to filter out judder when going over smaller patches of broken surfaces, or shopping mall car park type speed bumps. Hopefully, this will be improved by the next facelift. The air-conditioning also didn’t felt adequate enough for hot afternoons, especially for occupants in the rear. Our car came fitted with Ecotint window tinting, but it didn’t seem to help much. 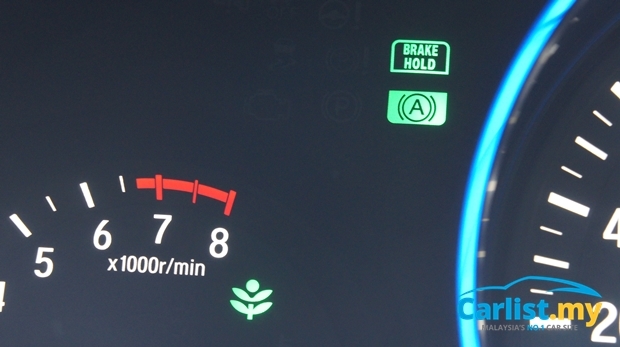 On the upside, the Automatic Brake Hold function is one of the smoothest we’ve ever tried. It relieves the driver of having to keep pressing the brake pedal in traffic. This is a common feature in many European cars but our experience with them have been mixed so far. Many of them don’t work as smoothly as they should. 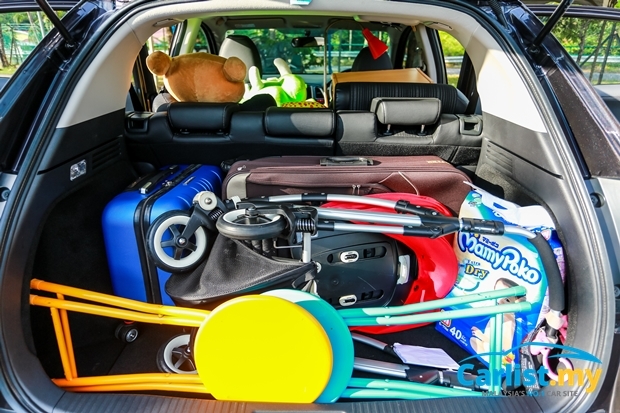 The one in the HR-V is among the better ones as it disengages in a smoother manner, at the slightest pressure from your left foot on the accelerator pedal. However in the interest of mechanical sympathy, it is better for users to shift the transmission to Neutral if the idling period is long. 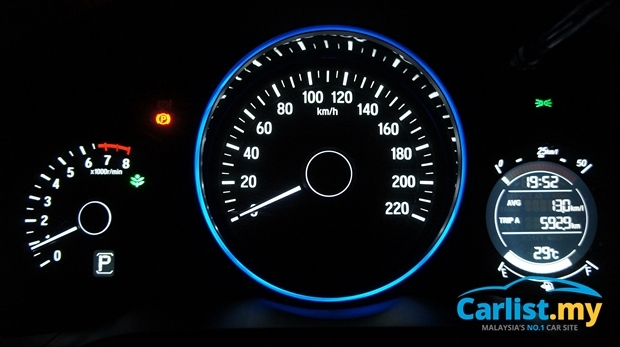 Over a 600 km plus distance, the HR-V returned an average fuel consumption of 13.0 km/litre (7.7-litre/100 km). That’s pretty good considering that this involved many full throttle accelerations climbing up Genting Highlands. Total maintenance cost over a 5-year/100,000 km period is RM3,548, but excludes consumables like tyres, brake pads and battery. 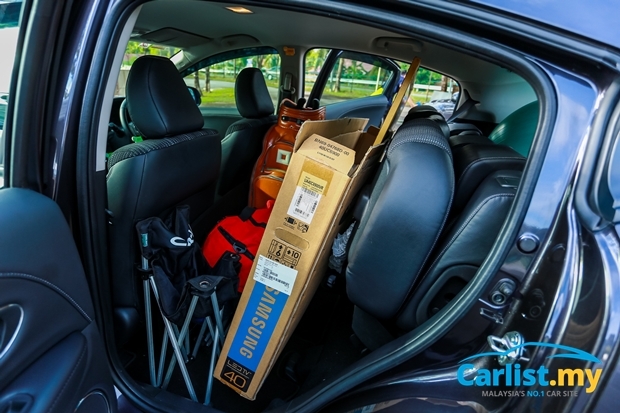 To sum it up, the HR-V has many great things going for it, its very practical interior especially. On the move however, it falls below our expectations but despite its dynamic shortfalls, overall it still is the best option in that segment. Being a Honda, its safety credentials is well above all other competitors and we are not talking about NCAP ratings. As explained in an earlier post, NCAP scores only consider single-vehicle incidences and Honda doesn't design its cars to just meet NCAP requirements, but to do well in real-world conditions. 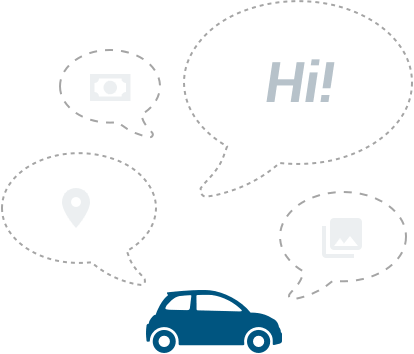 If you enjoy driving or are going do a lot of long distance driving in the car, we suggest that you look to the Civic instead.  The closest alternative is the ASX, which drives and rides better, comes with 4WD but doesn’t offer as much practicality, consumes a bit more fuel, and is showing its age. The Mazda CX-3 is just a taller, more powerful Mazda 2 and can’t match the HR-V’s all-round capability, not to mention its prohibitive RM135k price tag. If you are interested in one, we suggest that you wait till late-2016 or early-217 for a lower-priced, locally assembled variant. Or you can look to the cheaper locally-assembled Mazda CX-5. Prices for the new facelift model have yet to be confirmed but the base-model should start upwards of RM130,000, ten grand more than the most expensive HR-V.
There’s also the smaller Ford EcoSport and Peugeot 2008 but neither offers anything unique when pitted against the Japanese trio. None of the brands mentioned here however, can match Honda's wide network of service centres. 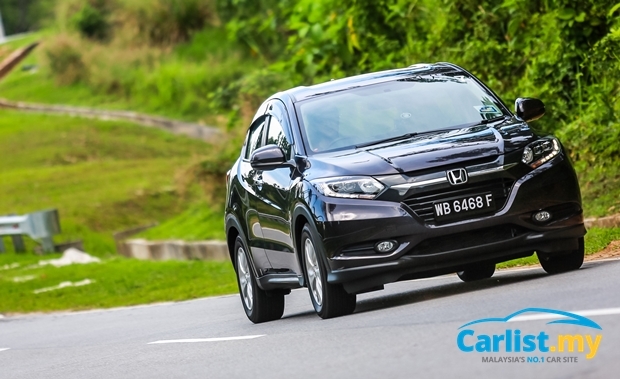 Find more Honda HR-V on sale at Carlist.my.